Two weeks ago we lost one of the all-time greats. It wasn’t George Washington, it wasn’t Einstein, it wasn’t Elvis, and it wasn’t Babe Ruth. It was my grandfather, Ben Robinson. Grandad was a special, special man who truly cared more about the welfare of others than that of his own. He had a huge impact on my life and I miss him a lot, but why on Earth would you visit a Phillies blog to read about my grandfather? In addition to sharing Grandad with the world, my purpose for this article is to demonstrate the powerful connection a simple game of baseball can create between two human beings. You see, baseball does not see in color, it does not care where you live, and it does not recognize age. Who among us can stake that claim? Here are a few of my stories. Few ten-year-olds have much in common with their 70-year-old grandfathers. My situation was no different. Grandad grew up in West Philadelphia, never graduated high school, spent four years fighting for our country in World War II, married a woman ten years younger, and retired with a pension from PECO at the age of 57. In contrast, I am unmarried, grew up in the quiet Philadelphia suburbs, attended a harmless public high school and a large public university, work in corporate America, and my combat experience involves a plastic gun that squirts water at its enemies. Yet I shared a powerful bond with a man 60 years my senior due in large part to a stupid little game with a white stitched ball and a wooden bat. Our connection began in 1984. I was standing in the backyard of Grandad’s home at age 5 in Ocean City, NJ. Grandad took me out back, set a ball on a tee, and told me to swing away. In a sure sign of things to come, Humpty-Dumpty could have perched on the tee without as much as a breeze. But Grandad would not let me quit until I hit the ball. Unaware at the time, I fell instantly in love with the game of baseball. Two years later, Grandad took me to a baseball card show (at the Ocean City Boardwalk) and introduced me to Bobby Thompson, the architect of the shot heard round the world. “Big deal,” I thought to myself. “Who cares about an old dude from a random team who hit a ball thirty years before I was even born?” All that interested me was the set of Topps 1986 baseball cards staring at me. But it was also another link in the chain connecting me and my grandfather. Grandad migrated in winters to Bradenton, Florida in the same temporary home as the Pittsburgh Pirates. What a joy it was one year when he returned from Florida with a baseball signed by nearly the entire Pirates squad! Guys named Bonds, Bonilla, Van Slyke, Drabek; all of their names were on my baseball. Even as a rival Phillies fan, this was the coolest thing EVER. To put it kindly, Grandad was a fair weather fan who began at an early age. Born and raised in Philly he decided to become, ehem, a Yankees fan. Hopefully Saint Peter won’t hold that against him. I guess nine years out of the playoffs was enough to drive him to the Pirates during their three year playoff run before hitching his saddle to the Braves’ bandwagon in the midst of their record 16 straight division championships. Then he conveniently came around to the home team Phils in 2007 after the first of four straight NL East titles. My family tried our best to show respect for our grandfather, but he received no such respect when it came to his bandwagon habits. The three men in our household who lived through one playoff appearance in 23 years with our Phillies showed no love towards someone who jumped from champion to champion. Boy, those were some fun battles, though! These may just be my stories, but there are countless other tales just like mine where baseball played a large role in forming the relationships in American boys’ lives. I wish you all could meet my grandfather because God doesn’t make ‘em like that very often. But in a sense you have met my grandfather and I have met many of yours, because the lifeline of baseball runs strong through all of us. The time has finally arrived for our annual 2011 Phillies player and team prediction blogs. Over the next two weeks we will share our Phillies 2011 player predictions and finish up with our overall 2011 team predictions for the Phils. Let’s begin with the infield. 2010 was a bit of a down year for Ryan Howard. He finished with a .276 average, 31 homers, 108 RBI, and missed 19 games due to injury. He struggled following the injury and was caught looking on the final pitch of the NLCS. Let's begin with his 2010 stats. Among his full season totals, Howard’s 31 home runs and 108 RBIs were career lows along with career lows in slugging percentage (.505) and OPS (.859). That prorates to 35 home runs and 122 RBIs over a full season, which still leaves him 10 home runs and 19 RBIs short of his actual totals in 2009. Those power totals might be a tad misleading considering Howard hit just .125 with 1 home run and 4 RBIs in his first 10 games following the injury. Even so, it is hard to ignore the power decline over the past three years. Howard’s prorated home runs dropped by 4, 3, and 10, and his RBIs dropped by 7, 4, and 20. On the other hand, Howard had four straight seasons of 40-plus homers and 135-plus RBIs from 2006 to 2009. A major contributing factor to Howard's success will be his protection in the lineup with the departure of Werth and the likely significant absence of Chase Utley. With those two gone, Howard may not see a fastball until July. It will be awfully tough to reproduce his past power numbers with a steady diet of junk. His playing shape and his fielding are valid considerations, as well. If you remember, Howard was in fantastic shape and arrived extra early to Spring Training prior to 2009 and his defense improved dramatically. But his fielding regressed greatly last year and I haven't heard any news of a renewed focus on his shape or defense this year. Finally, how will Howard respond to being a spectator on the final pitch of the NLCS? All of the evidence is pointing in the wrong direction for Ryan Howard with small but steady declines in home runs, RBIs, and defense. He carries the weight of the final strike on his shoulders. He doesn't have a big contract to drive him. And with Werth gone and Utley hurt, he will have little protection in the lineup. That paints a bleak picture and Howard will be tested more than he has in his entire year. His average will remain the same, but Howard will fail to hit 40 homers once again, his RBIs will drop, and his fielding will remain average at best. Click here for Ryan Howard’s 2010 report card blog and Howard’s career stats. Oh boy. Essentially all predictions for Chase Utley hinge on the tendonitis in his knee. If Utley needs surgery, there is a good chance he has no 2011 season. And if he is able to get on the field, he will certainly need to play through pain yet again. Utley finished 2010 with a .275 average, 16 homers, and 65 RBIs. Prorated over 162 games would have yielded 22 homers and 91 RBIs; all three stats are career lows. Even after prorating his stats, Utley's average (.275), homers (22), RBIs (91), Slugging Percentage (.445), and OPS (.832) have declined in each of the last four seasons. Chase's .275 batting average last year wasn't too far off his career average of .293, but Utley went from averaging a home run every 20.5 at-bats in 2006 to once every 26.5 at-bats in 2010. 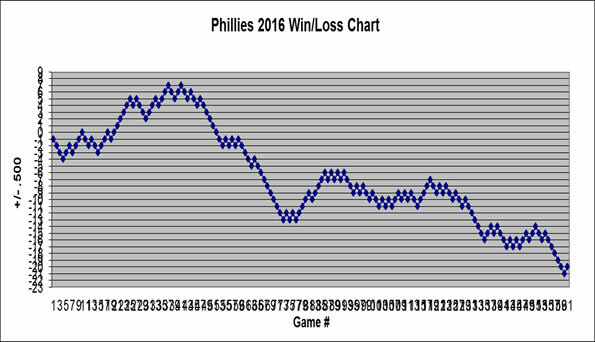 For whatever period of time we see Utley in 2010, there is no evidence to suggest he is on a positive track. His numbers have declined ever since he became a starter and last year they dropped more than they have in his entire career. Playing through pain all season makes it that much harder. Possibly the only thing working in Utley's favor is his bulldog competitor attitude. His competitive nature will help him avoid a horrific season and is the sole reason we predict just a slight drop off in his offense. For more info, check out Chase Utley’s 2010 report card blog and Utley’s career stats. Mark it down: 2011 will be a comeback year for Jimmy Rollins. Agreed, the numbers don't warrant such a comment. Rollins missed 105 games over the last three years and his offensive numbers have dive bombed since his 2007 MVP season. Rollins batted .248 with a .304 on-base percentage in his last two years combined. Folks, those numbers came in over 1,000 at-bats. Put simply, Rollins stunk for the last two seasons. But J-Roll's day of reckoning has come and he will respond. Ruben Amaro made it quite clear this off-season that Rollins is not 23 anymore and if he wants to play a full season, he will need to work out much harder in the off season. Rollins responded by adding yoga to his workout routine and arrived to Clearwater the earliest in his entire career. Jimmy wants to remove all doubt regarding his commitment. It wasn't just Ruben who called him out, though. Charlie Manuel also chimed in and suggested Jimmy needs to step up next year. Even Mike Schmidt decided to take a shot at Rollins, telling him to quit swinging for the fences and stop looking for his name in the paper. Rather than shy away from it, Rollins acknowledged their comments and gladly accepted all the pressure they tossed his way. And, oh yeah, this is his contract year. Throw away all the stats. Jimmy Rollins is as motivated to succeed as he has been in his entire career. He arrived extra early to Spring Training, accepted all criticism, and even had time for an outlandish prediction that the Phillies will challenge the record for most regular season wins. Jimmy is ready. Just wait and see. For more info, check out Jimmy Rollins' 2010 report card blog and Rollins' career stats. Placido Polanco gave the Phillies everything they asked for and more in the first year of his Phillies comeback tour. Through August Polanco was hitting .307 before his elbow problems led to a .261 average in the final month. Regardless of the injury, he had a great season and showed tremendous defense at third base. Polanco had surgery to repair the elbow, but his problems have returned as he hyperextended the same elbow. He says he will be ready for opening day, but what shape will he be in when he does play? Factoring injuries into the equation, Polanco should have a decent season for the Phillies. One year older and one more injury will slow Polanco down just a little. His three-year trend shows nothing dramatic with any of his statistics, so it does not appear he has hit the "age wall" yet. He will hit .285 with similar power numbers and will continue to play great defense at third. Visit this page for a complete listing of our report cards for all Phillies relievers and bench players. Visit this page for a complete listing of our report cards for all Phillies starters. Visit this page for a complete listing of our report cards for all Phillies position players.